Making an Apple Pie from Wax without using a mold. beginner or the advanced candlemaker from the experts are here! Making your own candles don't get any easier then these instructions. It is one of the first faux foods I learned. We are going to show you how easy it is to create this candle, for gifts or just because. with this no molds project is easy. You can make your own candles at home like this. When we started these were the tools we used, and this is the process we used. You don't need a lot of fancy expensive molds for candles. Why waste money on molds. Making your candle can be inexpensive, what you really want is fun, not expense. Here are basic instructions, I have used for home made wax pie crust. 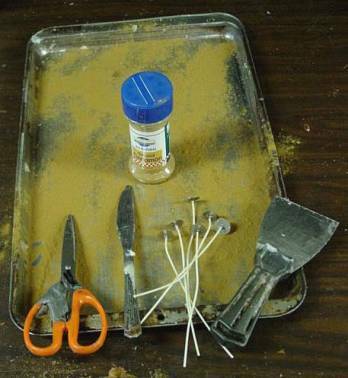 cinnamon, and scissors to cut the wicks with. I used a 9" by 16" pizza pan. Be sure your pan doesn't have Teflon or another coating. Wax sticks to Teflon. Gather your tools. Ready to start? First sprinkle pan with a generous coating of cinnamon. Melt 1 slab of our white wax. This wax seems to stay warm longer. Cooling quickly is not what's wanted here. You want wax to be like playdough, when it is halfway cooled in order to have time to work with it. After the wax is melted, add the scent and pour mixture into the cinnamon sprinkled pan. Now sit back and let it cool. It does take time for the pan to cool. temperature is very important in making candles, wax likes a warm room for cooling. Expert candle makers have a warming room just for cooling candles. As this wax is thin, it will cool sooner then if you poured it thicker. Try touching the middle, after the wax has turned white. Should feel firm in the middle, not saggy or mushy. Just firm, but not all the way cooled. That is the tricky part - too cool, the crust won't fold in half or it will crack. panic, you do have a window of warmth. You have to work your pie crust just like you would if you were making a real pie! You can pinch it with your fingers, use a fork, or any numerous other ways you make a real pie at home! It only takes a little work and a little effort to do this. The crust doesn't have to look perfect, add your own touch. Experiment with your crust. Make it your own. See the wax easily lift off the pan? The wax strip should just peel up. The cinnamon stuck to the bottom, giving a nice color? Lay the strip on the table and fold in two. Now place the strip around the top of a terra cotta flower pot bottom and start to make your crust. you will have a hudge bon fire. The final instructions step - let the wax, left in the pan, cool. Make the wax the color that you like. Dark gooey brown, light and creamy. Take the left over wax in the pan and tilt the pan, let it cool till there is a skim that forms on top. Take the skim to the top of the pan - on the high end of the tilt and beat/stir it up with a spoon..sort of like apple sauce. Then spoon it into your crust. 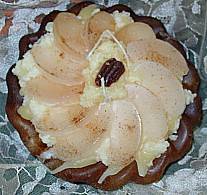 Top with some faux food apple and you have a candle pie! Looking good?......Good enough to eat! Be creative with your own pie candles. Try to top them with a lattice pie crust! Do it the same way you would a real pie! Or make a pie crust topping, add a few fork holes and pour in a little left over goo till it drizzles out! mixer - mixer unusable for anything else now, but who cares? Get the different color layers by using different color waxes and letting the first layer cool before going on to the secound layer. The first layer is one color, say lemon and the next layer is the white meringue. O, if you want an apple, and don't want to buy a mold. Pour thin wax on the pizza pan and take the plastic top of a spice bottle, or any bottle cap that size will do. Use it as you would a cookie cutter and stamp a bunch of round circles. Now cut the circles in half. There you have your apples. You can use the sprinkled cinnamon on the pans bottom for a better artistic look. for this 9" by 16" pizza pan. end with a paint scraper. Basic paraffin wax has been used for centuries in the art of making candles. home brings a feeling of warm comfort. Working with wax is an art form. Wax is unlimited in it's art form. Look at a wax museum! All wax! wedding cakes made entirely of wax! The right wax - your imagination - there's nothing you can't make wax do. Still don't want the fuss of making candles, we'll do it for you. well as the smaller amounts of wax. They last me for a couple of years. Policies. Cleo's Flea Market Finds.